Is it possible to use Rozeta LFO in Audiobus? I can’t find an equivalent to the midi routing features in AUM or apeMatrix. Am I missing something or is it not there? It will work for apps that can accept midi cc's directly. It won't work for AUv3 apps that only expose their parameters and don't have midi-learn or established cc's. 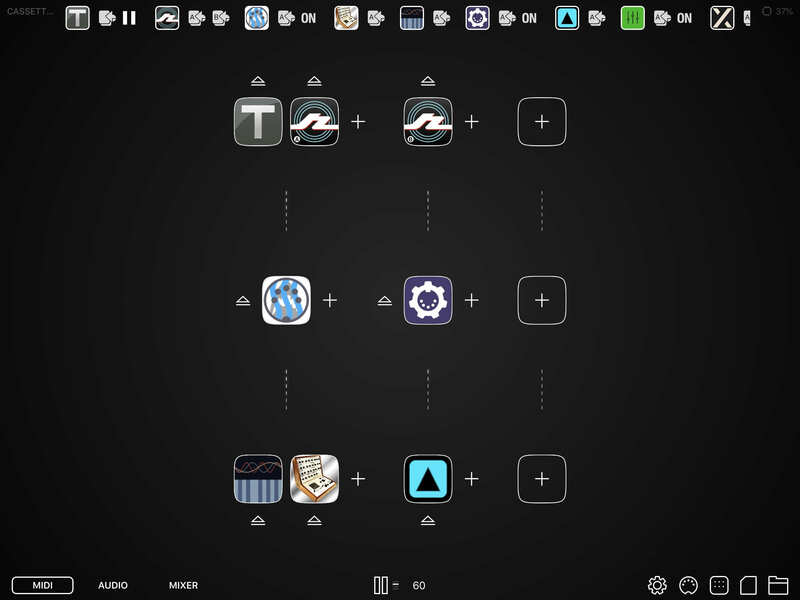 IAA apps, plus Troublemaker, Ruismaker, etc will work. What app(s) are you trying to direct it to? If I remember correctly, @michael is currently working on that. What I would most like is to control parameters of some FX, which I can do in AUM or apeMatrix. Is that possible in Audiobus? Not right now @murky_fish , but very soon! Hi--just wanted to revisit this--specifically I'm trying to control Spacecraft via Rozeta LFO (I do have the latest AB3 beta). You can't currently do it without a workaround (I think native support is coming though). 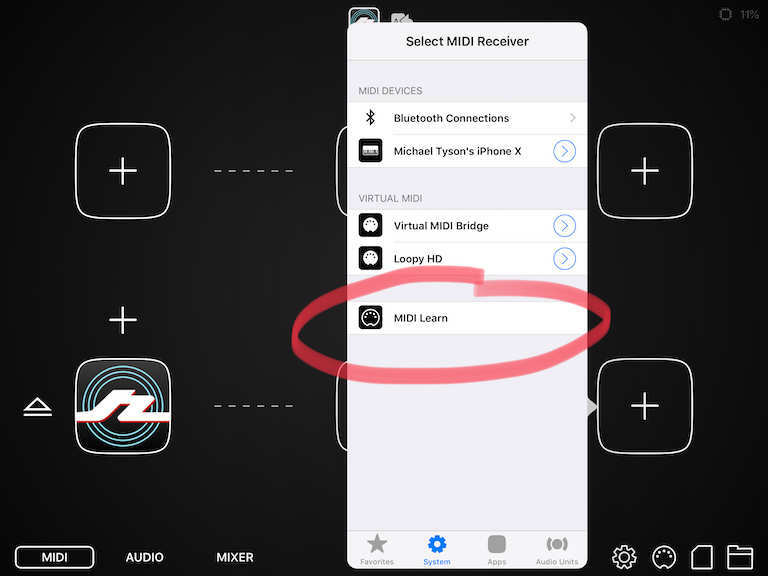 If you have the miditools from audioveek use the router filter to send the midi from Rozeta LFO to "audiobus 3" port then the midi learn on SpaceCraft AU can pick up the signal from Rozeta LFO. @Carnbot Cool work-around, thanks a lot ! Yep, working on this; it's a top priority for me. This is all finished and ready for testing in version 3.4 beta! Just tried it in the beta and it works great! Huzzah! Ok this looks great but I can’t figure out how to make it work! Tell me the routing?? Thanks! Yeah, took me a minute. Go to the MIDI tab and put a MIDI sender in. Then go to the MIDI receiver (end of lane) and select the System option at the bottom of the picker. You should see the midi learn option at the bottom. Thanks @lukesleepwalker I actually got that far then couldn't figure out what to do after! I haven't been using midi learn at all -- how do I assign one of the lfo to a spaceship parameter? The new midi routing port works great for the midi lane routings now but I'm a little puzzled. Maybe there's a good reason I'm missing? Cool, thanks for that--away from the ipad till later but will try then! The latest beta of SpaceCraft has all of the parameters connected input Ccs . Check comments of previous builds for the cc numbers. Would this make things easier ? It's just to make it a bit more obvious and visible, at least in theory. Yeah it makes sense in hindsight. For me I guess it's the visual nature of the midi lanes flowing top to bottom (or left to right), which makes it seem strange it doesn't just work without having to add the port, so if you learn the app at the receiver end it looks like the midi should just show up as it's flowing through the lane....but being able to eject it is useful as is a symbol that midi learn is active in the lane, so it does make sense after you use it. Yep, I find myself using AB a whole lot more now since the MIDI updates have come fast and furious. Very fast and easy workflow for me. Yeah same here, especially now that you can midi learn from the sender apps. The thing with having every MIDI pipeline feed into a hidden MIDI Learn receiver is that if you've actually got something loaded in there, and the transport is running, then MIDI Learn itself is gonna be near unusable as it'll be flooded with stuff from those lines, drowning out the command you actually wanna learn - unless the learn step comes with a selection of source first, but I don't wanna do that. I could move the receiver (or add it) to the Effects slot - feels like a receiver though, not an effect, so it seems odd to me. But that's just me. Anyone else wanna chime in? It is likely that the effects slot popped into my head because I've been using it a lot lately--many recent MIDI FX released lately. I think @Carnbot probably describes the expected behavior by most users. After all Rozeta LFO's job is to send MIDI CC data. And I'm not sure that the way you've set it up prevents the barrage of data anyway? I still got the barrage when I set it up with current functionality and I knew to turn off the transport and went back to Rozeta to turn off the CC's I didn't want to learn (or memorize the CC values to manually set in my receiver). So I think I agree with @Carnbot on this. Keep it simple!